← Electric Beanz Coffee Bar – More Than Just Great Coffee! Time to Get Your Garden Ready! With the weather finally warming up here in Raleigh, now is the perfect time to start preparing for your spring and summer garden. The heavy clay soils found in this area make raised beds and container gardenining a popular option. I spent last weekend turning over the soil in my square foot garden and adding compost and organic fertilizer. 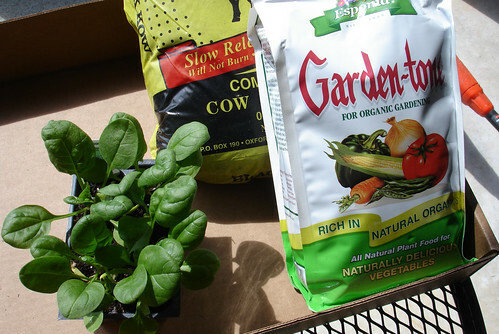 I like to add a bag of black cow compost and organic fertilizer like Espoma Garden Tone. Every year I try growing some things by seeds but I haven’t had much luck with certain plants so I purchase seedlings of those from are nurseries. 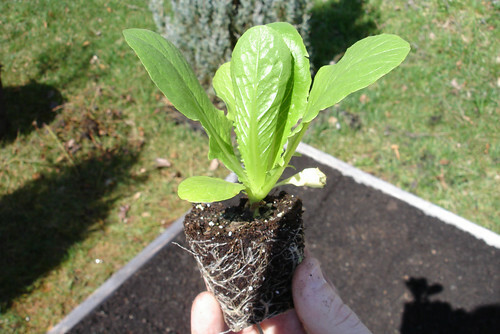 Pictured above is a romaine lettuce seedling I purchased at Logan’s in downtown Raleigh. They sell seedlings in packs of four for $1.59. 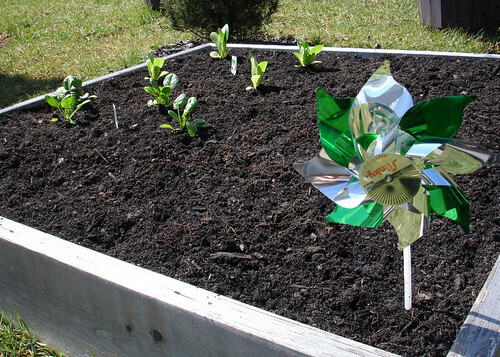 Early spring is a great time to grow cool weather leafy green crops like lettuce, cabbage, and spinach. By the time May rolls around it gets too hot for these types of plants so it is important to get them started in the garden early. This is the square foot garden I built last year. It is 4′ x 4′ and 8″ deep. Last year I filled it with planting media comprised of a mixture of compost, peat moss and vermiculite. With a square foot garden, you minimize the space needed for a garden by eliminating space needed for walking space between the rows of plants. 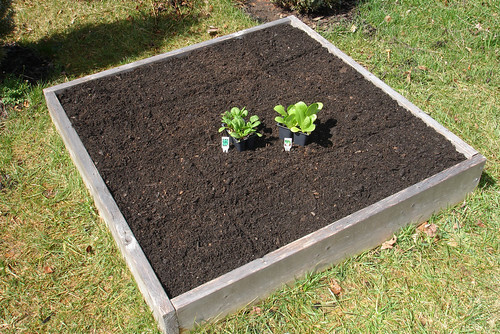 You break the garden into a grid giving 1′ squares to eac plant. For example, my 4′ x 4′ garden makes up 16 individual 1′ planting squares making enough room for sixteen different plants. Now that I have my cool weather crops planted (lettuce and spinach) I can start planning what I will plant for the warmer season after the last frost date, which is typically April 15th in this area. This year I am planning on growing several different herbs along with some cucumbers, peppers, and an heirloom tomato. I plan to buy seedlings for all three at the local farmers’ markets which should be in full swing by mid-April. For more information about gardening check out the NC State Extension website.